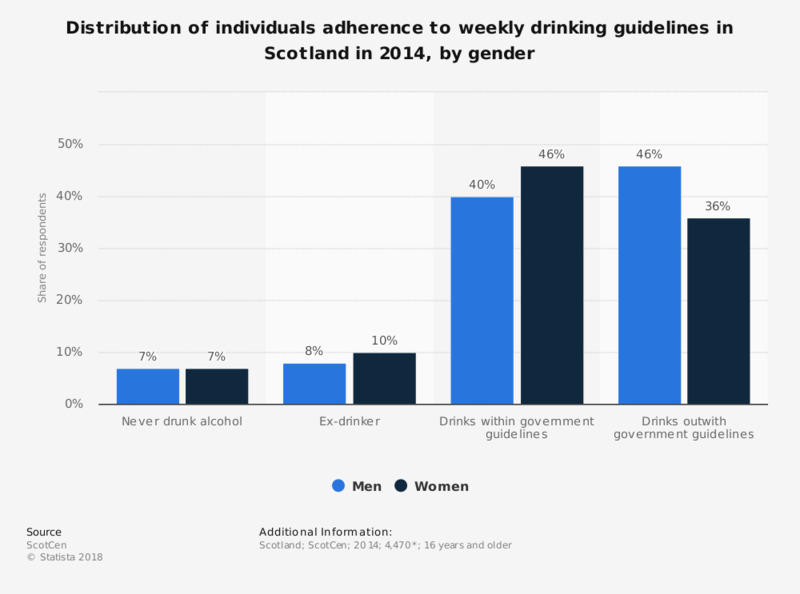 This statistic displays the distribution of individuals who adhere to weekly and daily guidelines regarding alcohol consumption in Scotland in 2014, by gender. In this year, 40 percent of men and 46 percent of women consumed alcohol within government guidelines. Drinking within government guidelines- drank no more than 4 units (men) or 3 units (women) on heaviest drinking day, and drank no more than 21 units (men) or 14 units (women) in usual week. Drinking outwith government guidelines- drank more than 4 units (men) or 3 units (women) on heaviest drinking day, and/or drank more than 21 units (men) or 14 units (women) in usual week.